We get to hear about human animal conflicts – much of it of elephants and other wild animals. In Zoology, there is the tetrapods ~ the superclass Tetrapoda are ‘four footed’ animals and would include amphibians, reptiles, birds, and mammals. In the city of Chennai, which has no flowing rivers [not to speak of Coovum and Buckingham canal] – I had posted of an incident at Nerkundram [which means place of paddy] where in the drying up lake in Chennai, a man grazing his cows had to run helter-skelter; as he sighted a crocodile ~ a fully grown fierce marsh crocodile or a mugger. The obvious trait of crocodiles is their long upper and lower jaws being the same width, and teeth in the lower jaw fall along the edge or outside the upper jaw when the mouth is closed. Crocodile attacks on people are common in places where large crocodiles are native and human populations live. 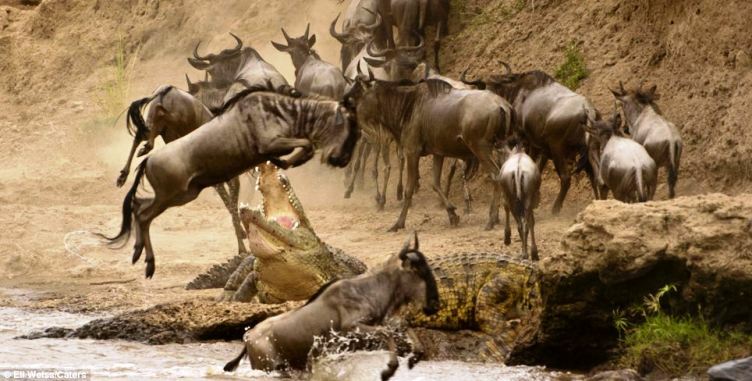 Not all species are considered to be dangerous to human – still one could tremble with fear if accosted by a crocodile. The mugger crocodile seen in India is dangerous to humans, killing many people in India every year. The attack of crocodile could in defense of its territory, nest, or self or can be predatory, accidental or in the course of handling by the people. Recently there was one such death in Cuddalore… it was reported that a 55-year-old farmer was killed by a crocodile at Kollidam in Cuddalore district. The farmer, identified as Jyothirajan, was washing his feet in the river after working in his plantain grove when the crocodile sprang up and dragged him into the river, its jaws clamped around his hips. The farmer’s terrified screams drew passersby, who attempted to rescue him by hurling stones at the crocodile. The reptile, which dragged him into the river for ashort distance, then let go of its prey.The farmer sustained severe injuries and died due to massive blood loss. Villagers alerted police. The locals claimed that the crocodile attacks on human beings and cattle had become common especially during heavy rain or when the river is in spate when water is released from Mettur. Experts say shrinking habitat and dwindling water resources are the prime reasons for the attacks. “People encroach on the habitat of crocodiles where there was no human settlement some 10 or 20 years ago. Moreover, dwindling water resources force them to stray into residential areas,” said an expert. Another Biologist attributed non-availability of small fish in the Kollidam river as the reason for the frequent attacks. “Rats are the only food available for crocodiles now,” he said. In Dec 2012, there was the news of a Crocodile eating a 12 year old boy …. down under in Australia. The death reportedly occurred near an Aboriginal outpost near Port Bradshaw, 400 miles east of Darwin. The reports suggested that when some tried rescuing the boy by attacking the croc, it dragged the boy, deeper inside the water. The tragedy highlighted the dangers of swimming in waterways in northern Australia. It was resented that the crocodile population had increased considerably and hence the increasing no. of attacks on humans and cattle. When the US President Barack Obama visited Australia’s Northern Territory, an insurance against Crocodile attack was obtained. Darwin boasts the largest crocodile numbers in Australia and a local Insurer offered a 50,000 Australian dollar ($51,000 U.S.) insurance policy against crocodile attack within the region. The novelty certificates, at a price of 10 Australian dollars, make popular souvenirs among tourists.